Built-in 1200 mAh rechargeable battery, can work continuously for 2 hours, support USB charging, so that hot weather travel is no longer terrible. 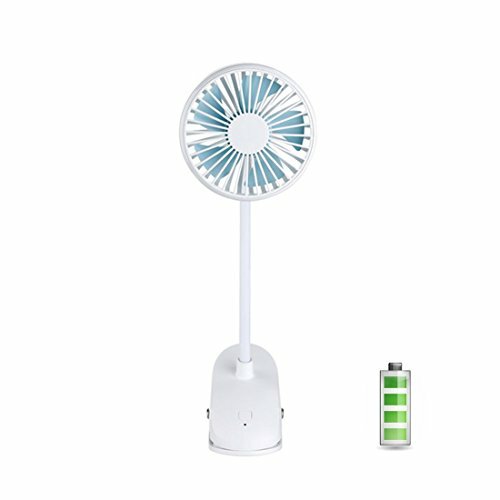 Versatile Use for all Age Groups and Situations The min personal fan can apply to many situation while you are studying, working or even shopping to use as an handheld cooler or desk fan. Fashionable appearance combined with practical function makes it a heat between children, teenage, office lady and so on. The maximum height of the clip is 10cm. It can also be placed on a flat tabletop as a base for the fan. When the clip is placed flat, adjust the center of gravity of the fan or attach the book to the front of the clip to increase the weight of the base and make the center of gravity of the fan more stable. 【5 Leaf Blade】 The 5 leaf fan face is larger than the ordinary 3 leaf fan, the wind volume is larger, 1st gear is 40dB, and 2nd gear is 59dB. The wind is concentrated and the air supply effect is even and soft. If you have any questions about this product by ONXE, contact us by completing and submitting the form below. If you are looking for a specif part number, please include it with your message.